This gorgeous oval bezel diamond halo east west setting can be set with either a 7 x 5mm Forever One Moissanite or a 8 x 6mm Forever One Moissanite from Charles and Colvard. The pave diamonds in the halo are handset and weight approximately 0.17cttw. All accent diamonds are G color and VS clarity. 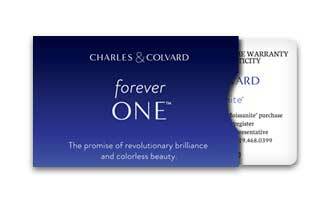 With Charles & Colvard Forever One Moissanite stones being similar to D-F color, there will a continuous flow throughout the piece. No detail is overlooked as this moissanite oval solitaire necklace is finished with beautiful milgrain work.